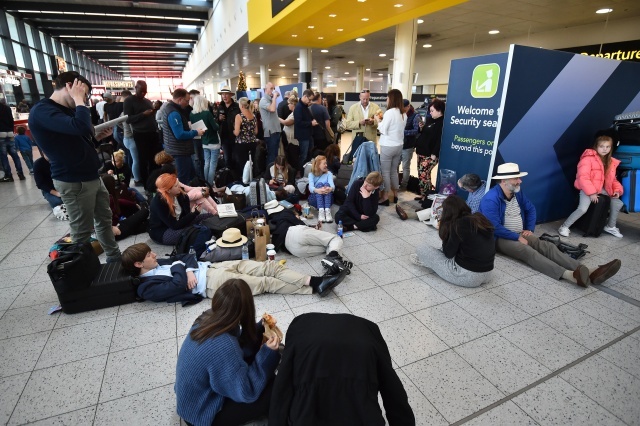 (AFP) - Britain called in the army Thursday after dozens of drone sightings grounded all flights from London's Gatwick airport for more than 24 hours, leaving tens of thousands of passengers stranded on one of the busiest days of the year. The airport, which closed its only runway Wednesday night after "reports of two drones flying in and around the airfield", said late Thursday it could not be reopened following further appearances of the devices. "Gatwick's runway remains unavailable because of continued drone sightings," it said in a 11:00pm (2300 GMT) update. "We think it may have been adapted and developed," said Detective Chief Superintendent Jason Tingley of the devices, adding officers were reviewing CCTV footage to identify the make and model. He said firearms officers were now considering shooting the device down -- despite authorities earlier saying that would be dangerous due to the danger of stray bullets. The runway closure stranded tens of thousands of travellers days before Christmas -- and prompted the unusual military operation. "We are there to assist and do everything we can," Defence Secretary Gavin Williamson told Sky News television, declining to give the troops' exact role and adding that it followed a request from local police. Gatwick, around 30 miles (50 kilometres) south of the British capital, is the eighth-busiest airport in Europe and sits behind Mumbai as the world's busiest single runway air hub. Easyjet, Gatwick's biggest operator, said it had cancelled all its flights in and out of the hub Thursday. Gatwick CEO Stewart Wingate said the incident was "a highly targeted activity which has been designed to close the airport and bring maximum disruption in the run up to Christmas". "We are working very closely with the police and the security services to try to resolve this for passengers," he said, adding "as soon as we can we will" reopen the runway. Police superintendent Justin Burtenshaw said: "We believe this to be a deliberate act to disrupt the airport. However, there are absolutely no indications to suggest this is terror-related." He added: "Each time we believe we get close to the operator, the drone disappears; when we look to reopen the airfield, the drone reappears." "We will continue to work with the Gatwick authorities and police will be working... in order to bring this to a close," she said at a press conference in London. "We're consulting on further aspects of this including further police powers," she added.